The CES ultra underscores its use of its conductive rubber ear clips. The rationale behind it is some interesting science on the ear; especially the vagus nerve and the special role it plays in the body. Read on. SUPER-HIGHWAY The vagus nerve runs from the brain stem down the neck and into the abdomen, reaching a slew of organs in the process. heart failure, diabetes and even intractable hiccups. In one recent study, vagus stimulation made damaged hearts beat more regularly and pump blood more efficiently. Researchers are now testing new tools to replace implants with external zappers that stimulate the nerve through the skin. But there’s a lot left to learn. While studies continue to explore its broad potential, much about the vagus remains a mystery. In some cases, it’s not yet clear exactly how the nerve exerts its influence. And researchers are still figuring out where and how to best apply electricity. Anchored in the brain stem, the vagus travels through the neck and into the chest, splitting into the left vagus and the right vagus. Each of these roads is composed of tens of thousands of nerve fibers that branch into the heart, lungs, stomach, pancreas and nearly every other organ in the abdomen. This broad meandering earned the nerve its name — vagus means “wandering” in Latin — and enables its diverse influence. The FDA approved the first surgically implanted vagus nerve stimulator for epilepsy in 1997. Data from 15 years of vagus nerve stimulation in 59 patients at one hospital suggest that the implant is a safe, effective approach for combating epilepsy in some people, researchers in Spain reported in Clinical Neurology and Neurosurgery in October. Twenty of the patients experienced at least 50 percent fewer seizures; two of those had a 90 percent drop in seizures. The most common side effects were hoarseness, neck pain and coughing. In other research, those effects often subsided when stimulation was stopped. Early on, researchers studying the effects of vagus stimulation on epilepsy noticed that patients experienced a benefit unrelated to seizure reduction: Their moods improved. Subsequent studies in adults without epilepsy found similar effects. 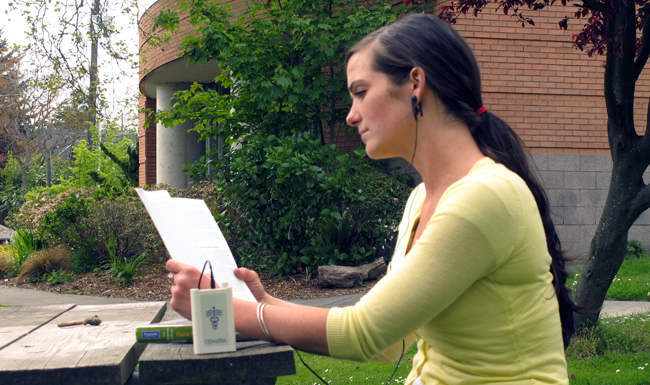 In 2005, the FDA approved vagus nerve stimulation to treat drug-resistant depression. Although many details about how stimulation affects the brain remain unclear, studies suggest that vagus stimulation increases levels of the neurotransmitter norepinephrine, which carries messages between nerve cells in parts of the brain implicated in mood disorders. Some antidepressant drugs work by boosting levels of norepinephrine. Silencing norepinephrine-producing brain cells in rats erased the antidepressant effect of vagus nerve stimulation, scientists reported in the Journal of Psychiatric Research in September. Vagus stimulation for epilepsy and depression attempts to target the nerve fibers that shuttle information from body to brain. But its fifth lane, which carries signals from brain to body, is a major conductor of messages controlling the body’s involuntary functions, including heart rhythms and gut activity. The nerve’s southbound fibers can also be a valuable target for stimulation. 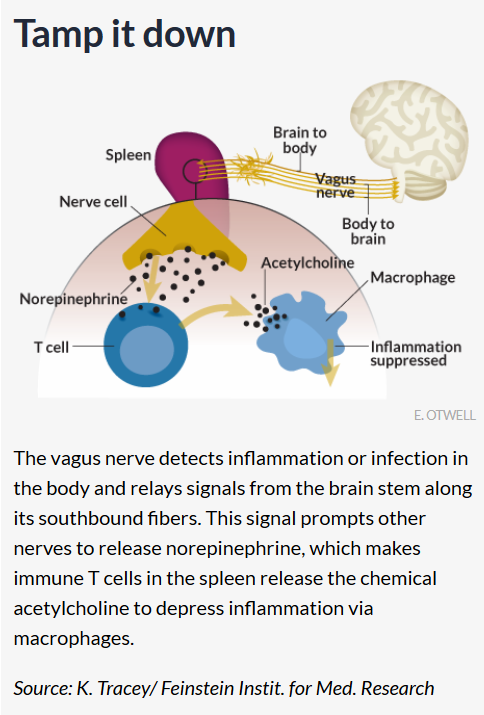 Around 15 years ago, scientists determined that the brain-to-body lane of the vagus plays a crucial role in controlling inflammation. While testing the effects of an anti-inflammatory drug in rats, neurosurgeon Kevin Tracey and his colleagues found that a tiny amount of the drug in the rats’ brains blocked the production of an inflammatory molecule in the liver and spleen. The researchers began cutting nerves one at a time to find the ones responsible for transmitting the anti-inflammatory signal from brain to body. “When we cut the vagus nerve, which runs from the brain stem down to the spleen, the effect was gone,” says Tracey, president and CEO of the Feinstein Institute for Medical Research in Manhasset, N.Y. Later research indicated that stimulating undamaged vagus fibers also had anti-inflammatory effects in animals. Vagus stimulation prompts release of acetylcholine, Tracey and colleagues reported in 2000. Acetylcholine, a neurotransmitter like norepinephrine, can prevent inflammation. In 2011, rheumatologist Paul-Peter Tak, of the University of Amsterdam, and his colleagues implanted vagus nerve stimulators into four men and four women who had rheumatoid arthritis, an autoimmune inflammatory condition that causes swollen, tender joints. After 42 days of vagus stimulation — one to four minutes per day — six of the eight arthritis patients experienced at least a 20 percent improvement in their pain and swelling. Two of the six had complete remission, the researchers reported at an American College of Rheumatology conference in 2012. “From a scientific perspective, it’s an extremely exciting result,” says Tak, who is also a senior vice president at GlaxoSmithKline pharmaceuticals based in Stevenage, England. Despite advances in treatments over the last two decades, rheumatoid arthritis patients need better options, he says. In 2014, Tak and his colleagues reported that vagus stimulation reduced inflammation and joint damage in rats with arthritis. After a week of once-daily, minute-long stimulation sessions, swelling in the rats’ ankles shrank by more than 50 percent, the scientists reported in PLOS ONE. If these results hold up in future studies, Tak hopes to see the procedure tested in a range of other chronic inflammatory illnesses, including inflammatory bowel disorders such as Crohn’s disease. Studies in animals have shown promise in this area: In 2011, researchers reported in Autonomic Neuroscience: Basic and Clinical that vagus stimulation prevented weight loss in rats with inflamed colons. Treating inflammatory conditions with vagus stimulation is fundamentally different from treating epilepsy or depression, Tak says. More research with patients will be necessary to develop the technique. “We are entering a completely unknown area, because it’s such a new approach,” he says. There could be financial hurdles as well, he says. But GlaxoSmithKline, which Tak joined after initiating the arthritis study, has purchased shares of SetPoint Medical, a company in Valencia, Calif., that produces implantable vagus nerve stimulators, Tak says. As he and others put stimulation to the test for inflammation, some scientists are attempting to see if manipulating the nerve can help heal the heart. This entry was posted in CES Research, CES Ultra device on February 21, 2017 by cesadmin. Yet so far, results from studies on the effects of vagus stimulation on heart failure have been inconsistent. In 2011, researchers reported in the European Heart Journal that repeated vagus nerve stimulation improved quality of life and the heart’s blood-pumping efficiency in heart failure patients. A vagus stimulation trial of heart failure patients in India published in the Journal of Cardiac Failure in 2014 echoed these results. After six months of therapy, the patients’ left ventricles pumped an average of 4.5 percent more blood per beat. Another group of scientists is testing more intense vagus stimulation for patients with heart failure. The trial, called INOVATE-HF, is funded by the Israeli medical device company BioControl Medical and uses a higher level of electrical current than the European study that showed no measurable improvements. “If you try to lower blood pressure and you take a quarter of a pill instead of one pill, blood pressure won’t change,” says cardiologist Peter Schwartz of the IRCCS Istituto Auxologico Italiano in Milan. It’s equally important to use the right dose of vagus stimulation, he says. The new trial is also much larger than earlier studies, with more than 700 patients enrolled internationally. Results are expected by the end of 2016. Vagus manipulation isn’t limited to heart failure research. It’s also being tried in atrial fibrillation, in which the heart flutters erratically. “When it flutters, it doesn’t really push blood very efficiently,” says clinical electrophysiologist Benjamin Scherlag of the University of Oklahoma in Oklahoma City. Atrial fibrillation is common in people over age 60, Scherlag says, and can ultimately lead to blood clots and strokes. Treatments include drugs that alter heart rhythm or thin the blood, but they don’t work for all patients and some have nasty side effects, Scherlag says. 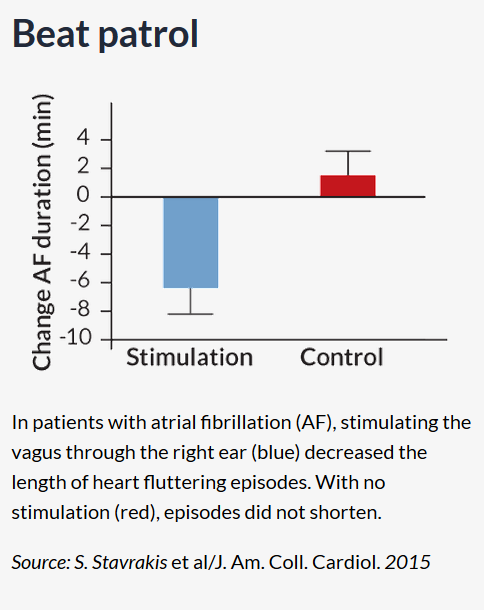 In the lab, scientists can use high-intensity vagus stimulation to alter heart rhythm and induce atrial fibrillation in animals. But milder stimulation that alters heart rate only slightly, if at all, can actually quell atrial fibrillation, animal studies and one human study show. But in the ear, tiny fingers of the vagus’s fibers run close to the surface of the skin, primarily under the small flap of flesh, the tragus, that covers the ear’s opening. Studies have explored using stimulation of those fibers through the skin of the ear to treat heart failure, epilepsy and depression, as well as memory loss, headaches and even diabetes — a reflection of the nerve’s control over a variety of hormones in addition to acetylcholine and norepinephrine. 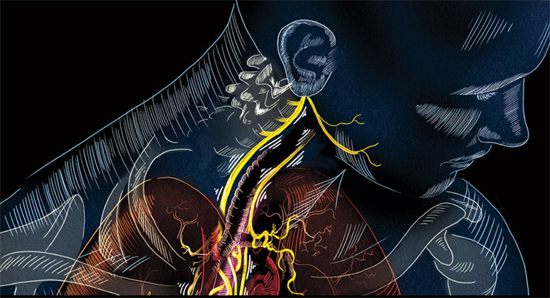 Stimulating the vagus nerve through the ear of diabetic rats lowered and controlled blood sugar concentrations, researchers from China and Boston reported in PLOS ONE in April. The stimulation prompted the rats’ bodies to release the hormone melatonin, which controls other hormones that regulate blood sugar. Ear-based vagus stimulation appeared to improve memory slightly in 30 older adults in the Netherlands. After stimulation, study subjects were better able to recall whether they had been shown a particular face before, says study coauthor Heidi Jacobs, a clinical neuroscientist at Maastricht University in the Netherlands. The researchers, who reported the work in the May Neurobiology of Aging, plan to investigate whether these effects last over time and exactly how the stimulation affects the brain, Jacobs says. The ear isn’t the only nonsurgical target. The company electroCore, based in Basking Ridge, N.J., manufactures a small, handheld device that can stimulate the vagus when placed on the throat. The company initially tested the devices to reduce asthma symptoms — relying on the nerve’s anti-inflammatory action. But during testing, patients reported that their headaches were disappearing, says J.P. Errico, CEO of electroCore. Now, the company is investigating the use of an electroCore device to treat chronic cluster headaches, severe headache attacks that can come and go for over a year. People suffering from an average of 67.3 cluster headaches each month experienced around four fewer attacks per week on average when using the device along with standard treatments like drugs, researchers reported in Cephalalgia in September. 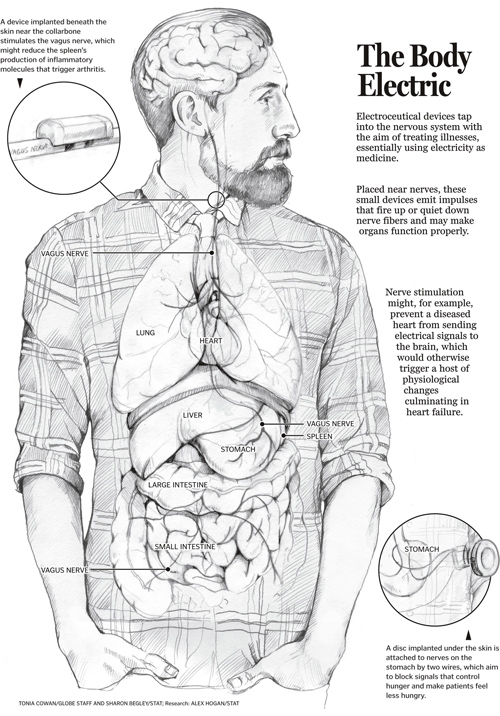 Even for depression and epilepsy, Tak says, researchers still need to figure out the best ways of stimulating the vagus — exactly where to place a device, and how much of a shock to deliver. The nerve’s multitasking, two-way nature makes it a challenge to fully understand and control. It’s hard to know exactly what you’re zapping when you stimulate the vagus nerve, says physiologist Gareth Ackland of University College London. He compares vagus stimulation to flipping on a light switch in one room of a house and discovering that this endows other rooms in the house with magical powers. “I’m not sure which room it’s going to happen in, I’m not sure for how long and I’m not sure if, after a while, it’s going to work or not,” he says. The intensity of electrical current, duration of stimulation and each patient’s health status could all affect the results of a vagus stimulation trial, Ackland says. And it’s possible that a widespread effect, such as suppressing inflammation caused by the immune system, could even be harmful to some patients. Ackland says that he and his colleagues agree that the vagus nerve is important. And he’s not ready to discount vagus stimulation as a potential therapy for conditions such as heart failure. But he warns that there’s a good deal of biology left to understand. “There’s an awful lot of basic science and basic clinical research that is needed before launching into a variety of potential interventions,” he says. This entry was posted in CES Research, CES Ultra device on February 20, 2017 by cesadmin. In the 1930s clinicians began to use very high electric currents in order to produce convulsions in patients. This was known as electroconvulsive shock therapy, or ECT, and is still sometimes used in America to treat difficult cases of depression. One of its drawbacks is that patients have to be guarded against breaking bones or doing other physiological damage during the convulsions. Often they are strapped down or given medications to help prevent damaging convulsions. Also, patients complain of memory difficulties that can bother them for up to 6 weeks following the shock treatments. When we first began publishing studies on CES in America back in the 1970s, peer reviewers often read our papers as ECT papers, since they did not know about CES and therefore couldn’t tell the difference. Many early CES papers were turned down by peer reviewers as a result, since the studies didn’t make sense as electroconvulsive shock research. Another electrical treatment that began in America in the 1970s is transcutaneous electrical nerve stimulation, or TENS. In this treatment, patients typically place electrodes on or near the pain site on their body and stimulate with varying small pulses of electricity, with a wide range of pulse rates available, often going from less than one pulse per second to several thousand pulses per second. In contrast, CES (Cranial Electrotherapy Stimulation) employs gentle electrical stimulation to the head to help normalize brain functioning. CES is safe, effective and affordable. CES units are easy to use. This entry was posted in CES Ultra device on February 14, 2017 by cesadmin. While electricity had been used in medicine for some time, in the early 1900s researchers in Europe began trying to find a way to use electricity to put people to sleep. They tried different pulse rates, various intensities of stimulation, direct and alternating (biphasic) current and so forth. They found that if they used a strong enough current, they could put patients into unconsciousness, but the patient tended to regain consciousness the minute the current was turned off. Japanese bullet train – The Japanese picked up on the ability of the Somniatron to relax persons, and after finding that the engineers on the bullet train tended to become very tense due to the unusual speeds they were driving, and the many unknown safety hazards that might be involved, they began using electrosleep for 20 minutes prior to their run from Tokyo to Kyoto, then using it for another 20 minutes before returning to Tokyo. To do this, the engineers reclined in a dark room with the Somniatron electrodes attached to their head. Dallas Texas – Ray Gilmer who was an engineer working for an entrepreneurial company just outside Dallas, Texas, saw an article in the Dallas newspaper about the Japanese use of electrosleep to relax its train engineers and went over to investigate. He bought a Somniatron and brought it back to Texas. Neurotone – Ray Gilmer then began a new company, NeuroSystems, Inc., in Garland, Texas which is just outside of Dallas, and engineered a unit similar to the Somniatron and named it the Neurotone 101. He began marketing it both for research and medical use. It was about the size of a double wide briefcase, and because of two large rechargeable batteries, weighed some 20 pounds. It pulsed at either 50 or l00 Hz, with a biphasic pulse limited to 1.5 mAmps on a 20% duty cycle. It was researched widely at various American Universities, and medical facilities beginning in the early 1970s. CES and FDA: Numerous 510(k) units. In 1976, the U.S. Congress passed a law giving the U.S. Food and Drug Administration control over medical devices. Their new duty was to make sure that every new medical device sold in America was both safe and effective for use. Since the Neurotone device was being sold in the U.S. prior to the passage of the law, the Neurotone was grandfathered and did not have to pass the new rigid standards of safety and effectiveness. Because it was then sold for the treatment of insomnia, depression and anxiety, the FDA changed the name of the treatment from “electrosleep” to “cranial electrotherapy stimulation,” the name still in use in the U.S.A., although it is till known as “electrosleep” (CES) in most of the rest of the world, and “neuroelectric therapy” in Great Britain. If a new company wanted to manufacture and sell a CES device they could either do approximately $80 million in research in animals and humans to show their unit’s safety and clinical effectiveness, or they could show the FDA that their unit was substantially similar to the grandfathered Neurotone device, or its later miniaturized equivalent, the RelaxPak. The process was known as the 510(k) process, referring to the section of the law which provided for it. Perhaps 10 or more CES units have come into the American market through the 510(k) process. Unlike in most of the world, the FDA first demanded that only licensed physicians could order the use of a CES device, and later changed it so that any licensed medical practitioner could order its use. As of now, physicians, Nurses, chiropractors, licensed psychologists, licensed acupuncturists, licensed massage therapists and so forth can order a CES unit for patient use. In Canada and many other countries, patients can buy them in pharmacies or wherever else they are sold. Tri-annual conference in Gras, Austria, Bulgaria, etc. For many years, an international conference on electrosleep was held, usually in Europe, every three years in which electrosleep researchers gathered from all over the world to present research papers. I went to one of the last ones in Varna, Bulgaria, in 1981, after which the professor who organized them died and the conferences ceased. This entry was posted in CES Research, What they tell about CES Ultra on February 12, 2017 by cesadmin. This story was produced by Stat, a national publication from Boston Globe Media Partners that will launch online this fall with coverage of health, medicine, and life sciences. This entry was posted in CES Research on February 1, 2017 by cesadmin.